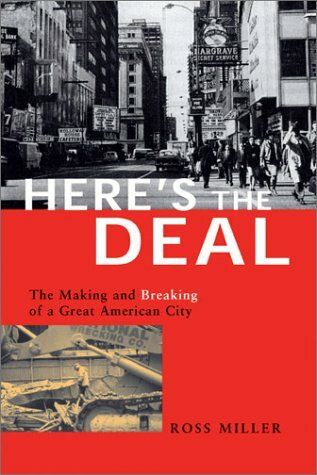 A hard-hitting study of how ambition and greed are leading our cities to disaster. Before there was a Ground Zero in New York City, Block 37 was a giant hole in the heart of a great American city. In 1990, Chicago’s Block 37 (as a key part of a twenty-seven-acre urban renewal project) was razed to the ground. After the expenditure of nearly $250 million of public and private capital, nothing has been built on this once vital and densely-occupied city block. This stubborn vacancy at the center of Chicago’s historic downtown eerily presaged the post 9/11 wasteland in Lower Manhattan. In a new critical introduction, Ross Miller makes the historical and political connections necessary to understand how modern city planning and redevelopment really works. By exploring one American urban block in meticulous detail, Miller clarifies the opaque process that continually breaks and remakes our most vital cities. 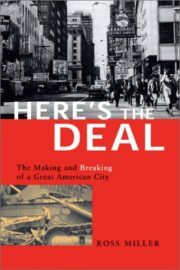 Here’s the Deal is a thrilling true-life story of back room deals and political promises. Told throughout with the scrupulousness of serious scholarship and the excitement of a novel, Here’s the Deal is already considered a modern classic of urban literature.